Before the lesson, students work individually on an assessment task that is designed to reveal their current understanding and difficulties. You then review their solutions and create questions for students to answer in order to improve their work. After a whole-class introduction, pairs of students work together to justify or refute mathematical statements. They do this using their own examples and counterexamples. 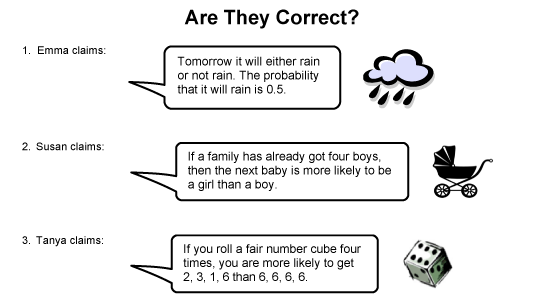 Students then explain their reasoning to another group of students. In a whole-class discussion students review the main mathematical concepts of the lesson. Each individual student will need a copy of the assessment tasks Are They Correct? and Are They Correct? (revisited), a mini-whiteboard, a pen, and an eraser. Each pair of students will need a copy of the sheet True, False or Unsure?, (cut up into cards), a large sheet of paper for making a poster, and a glue stick. 15 minutes before the lesson, a 1-hour lesson, and 20 minutes in a follow-up lesson. Timings are approximate and will depend on the needs of the class.